Roe, by Lisa Loomer, was commissioned by the Oregon Shakespeare Festival in 2012 and has played several festivals around the country. 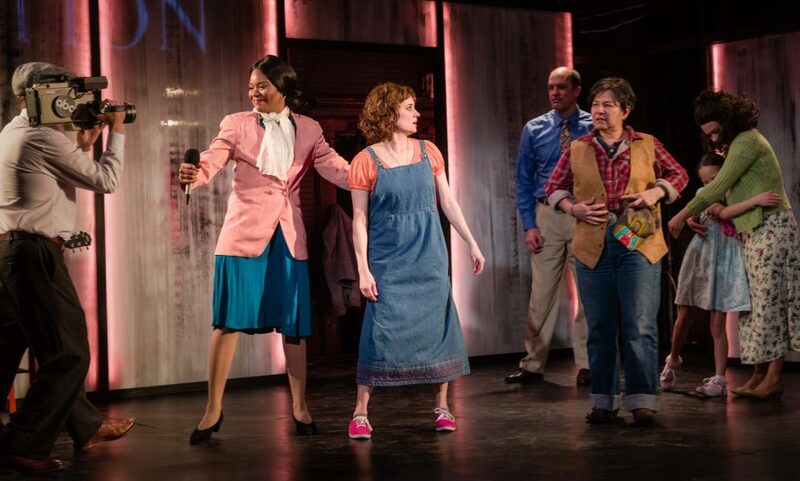 However, it has now been optioned for Broadway and Mixed Blood Theatre is the "only regional theater in the country that has been given permission to produce it this season." And what a production they have created. If the Broadway producers have any sense, they'll come to Minneapolis, scoop up this entire cast and this exact production, and bring it all to New York. Here's the thing: Roe is a really, really good play. Lisa Loomer weaves together all of the complicated elements and emotions surrounding the incredibly polarizing issue of choice and creates a balanced, clear-eyed and resonant play. She uses the participants' own words to bring the story to life, and her characters contradict each others' accounts when their recollections don't quite match. It's a lively and engaging technique, which the playwright uses to powerful effect. And this CAST. 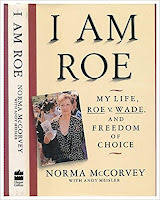 Tracey Maloney plays Norma McCorvey (aka "Jane Roe"). 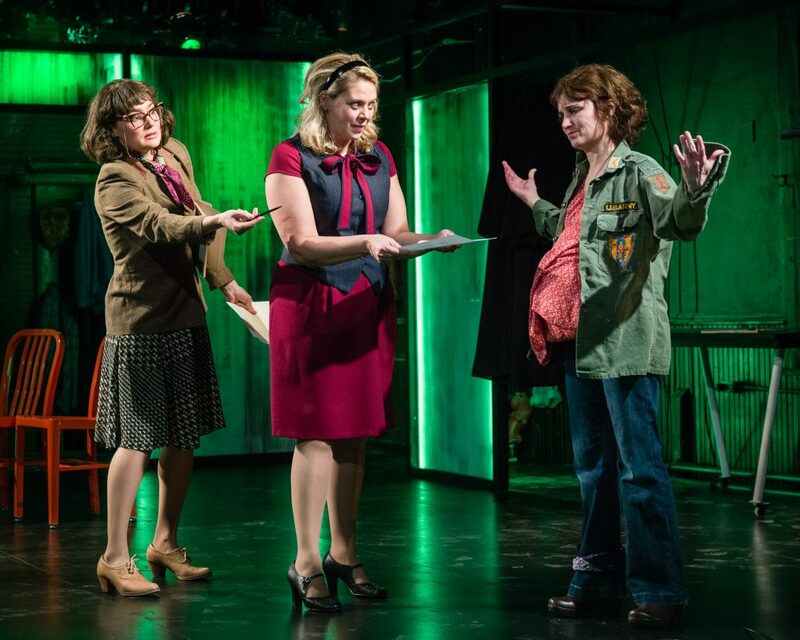 Maloney takes this complicated, conflicted and divisive character and brings her utterly to life. She is, in turns, sympathetic, irritating, and achingly relatable. 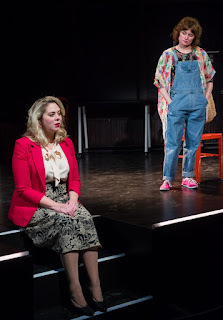 Laura Zabel, as lawyer Sarah Weddington, is perfectly buttoned-up and determined, though we eventually see she has her own history and issues. Massive shout-outs to the entire ensemble: Sam Bardwell, Michael Booth, Kate Guentzel, Dame-Jasmine Hughes, Jamila Joiner, Olive Middleton, Patrick O'Brien, and Lisa Suarez, who alternate between multiple roles wonderfully. 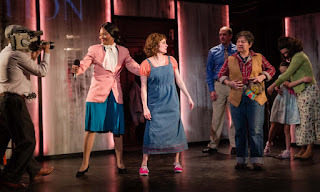 Their transformations are aided by Sarah Bahr's on-point period costumes and Emma Gustafson's truly stunning and appropriate wigs. Extra special love for Bonnie Allen, who plays vastly contrasting roles as an Operation Rescue volunteer and Norma's horrible mother with equal verve. Every element of this production, directed by Mark Valdez, is perfect, from the music that heralds the beginning of each new era, and the lights and projections that add to the strong sense of place, to the seamless use of real audio from the Supreme Court, and breaking of the fourth wall. The pacing is incredible and emotional resonance is profound. Even for those of us with short attention spans (aka Carly), the play absolutely raced by in seemingly ten minutes. One of the things we loved and admired best in Valdez's direction is that he keeps the play so tight that there's no room for the kind of self-satisfied applause that can so easily disrupt the energy and mood of a play. 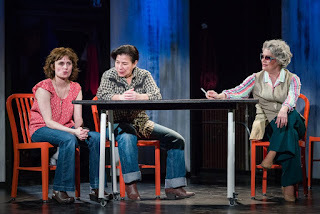 Mixed Blood always does great outreach work, but with Roe they have gone even farther, hosting two "book club" discussions of the script in the weeks leading up to the production, and working with community partners for post-show talkbacks and hosting continuing legal education sessions around the play. 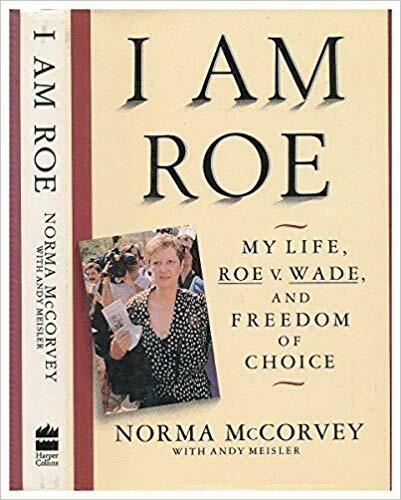 If you leave the play, as we did, wanting to explore more about Roe v. Wade and the current state of choice, may we suggest the following?